It was the official Sundance weekend kick off! Our guests were able to enjoy events at the WanderLuxxe House and around Park City, with shuttle service provided by Tesla. 3pm: We hosted an Après Ski Happy hour with Casamigos, Peet’s Coffee and Apex Social Club. 8:30pm: WanderLuxxe hosted the private after party for the film Mandy starring Nicolas Cage, and Andrea Riseborough with Elijah Wood DJing. This event was presented by OTTLending. 10am: What better way to start the day than working up a sweat? Our daily fitness class hosted by Trammell Logan from SoulCycle, followed by mediation began today. After meditation Aveeno offered mini facials to guests. This all took place at the WanderLuxxe House. 1pm: We were super proud to host the Women in Film Panel featuring Robbie Brenner, Stephanie Allian, Nikki Silver, and Nina Yang Bongiovi moderated by Darrien Gipson from SAG Indie. 3pm: After the panel WanderLuxxers and guests checked out our daily Après Ski Happy Hour. 4pm: WanderLuxxers attended the Power Women Cocktails event with Issa Rae, Tessa Thompson and Aisha Tyler. 10pm: We ended the day hosting the Nancy film premiere after party, as our guests danced the evening away. 10am: Once again our daily fitness class was packed, as was the mediation that followed. Guests continued to enjoy their mini facials by Aveeno. 4pm: WanderLuxxers and guests attended our private film event for Augustine Frizzell’s Never Goin’ Back starring Cami Morrone, Kyle Mooney, and Maia Mitchell. The event also featured Casamigos Après Ski with Apex Social Club and Peet’s Coffee bar. 8pm: WanderLuxxers and guests rocked out with Common and Friends with private performances from John Legend and surprise guests such as Will. I. Am, Idris Elba, Craig Robinson, and LaKeith Stanfield, presented by Dropbox, Apex Social Club and Remy Martin. Everyone enjoyed a midnight snack delivery by Postmates to keep the party going! It was our second year hosting this exclusive party! 10am: We started our day right with our daily fitness class and meditation, and relaxed with an Aveeno mini facial. 3pm: Later in the afternoon we saw many familiar faces at our daily Apres Ski Happy Hour. 8pm: WanderLuxxers and guests enjoyed our private film party for A Boy. A Girl. And A Dream with Omari Hardwick, Jay Ellis and Meagan Goode. ASAP Rocky was also in attendance. 9am: Our last day! We had to keep the momentum going with our daily fitness class, meditation, and luxurious mini facial. 11:30am: We hosted a private brunch with Tonya Lee, producer of the Sundance Film, Monster. 2:30pm: We ended Sundance by hosting a Rising Stars Panel moderated by Ben Lyons. There you have it! It was a whirlwind, action packed few days but we wouldn’t want it any other way. 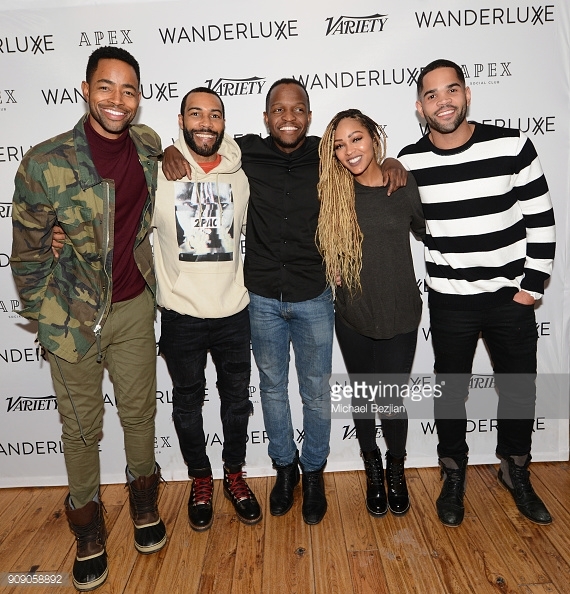 We had a blast showing old and new WanderLuxxe members the best of the Sundance Film Festival. Don’t want to miss out on another epic event? Become a WanderLuxxe member today and we’ll see you on the next red carpet.